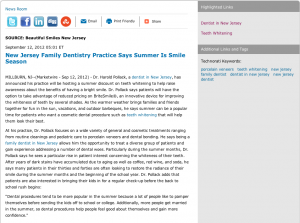 Millburn, NJ — Dr. Harold Pollack, a dentist in New Jersey, has announced his practice will be hosting a summer discount on teeth whitening to help raise awareness about the benefits of having a bright smile. Dr. Pollack says patients will have the option to take advantage of reduced pricing on BriteSmile®, an innovative device for improving the whiteness of teeth by several shades. As the warmer weather brings families and friends together for fun in the sun, vacations, and outdoor barbeques, he says summer can be a popular time for patients who want a cosmetic dental procedure such as teeth whitening that will help them look their best. A graduate of the Temple University School of Dentistry, Dr. Harold Pollack is a member of the American Academy of Cosmetic Dentistry, the American Dental Association, the New Jersey Dental Association, and the Pankey Institute Alumni Association, as well as a Fellow of the Academy of General Dentistry. He has dedicated over 4,000 hours to his continued education through various workshops, lectures, and courses in advanced dental techniques. Dr. Pollack has also been selected as one of the “Best Dentists in America” and a “Top Dentist” by NJ Monthly.